Bobbie Thompson of the Egbert Benson Historical Society of Red Hook NY kindly send photocopies of this 1902 view of the Burrell House in Sabinsville. This and two other photos in their collection are from our area. Can anyone tell me if htis house is still standing? This photo, also, appears to be of the Burrell Family. 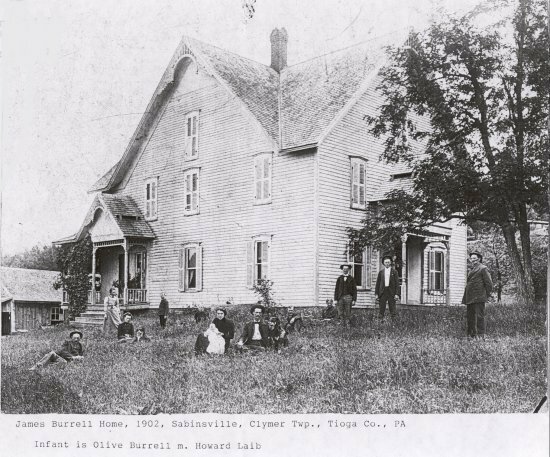 I can match the clothes and people form the house photo and determine that they are the same people.I checked the cemetery listings from Clymer Township and was not able to locate members of this family. Can anyone tell me about them? From collection of Egbert Benson Historical Society in Red Hook NY. Dear Joyce, About the photos-- the reason you didn't find them in the Clymer cemeteries or census is because the house was in Chatham Twp. ; the road in front of their house was the township line between Clymer and Chatham. The barn was across the road in Clymer and I have every reason to believe that it was the Burrell barn in the picture of the barn raising, Both the house and the barn were built by Uncle Jim Burrell (his wife Olive was my grandfather Ashley Short's sister)-- I remember both buildings; the house burned in the 69's or 79's and the barn is now gone. 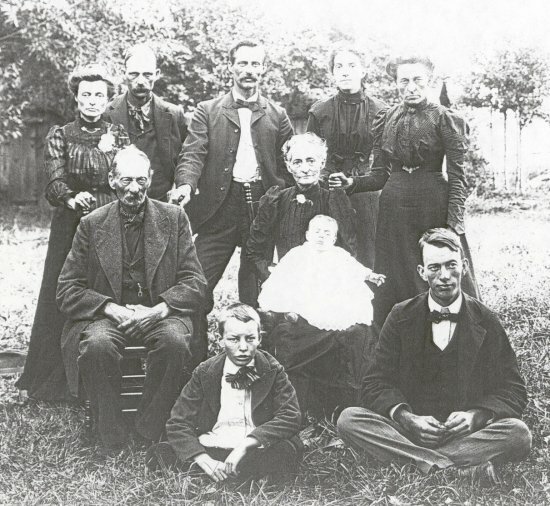 In the group photo, the only person I recognize is Wallace, who is standing directly behind his father, and I'm presuming that the lady beside him is his wife Hattie (Butts) and the baby on Aunt Ol's lap just has to be Wallace and Hattie's only child, Olive. Olive married a Laib ; they lived in Red Hook, N..Y. for many years and ran a hotel there. In the early 1990's, my sister, niece and I visited Olive there; haven't heard from her recently so she may have died.